Some recipes make you want to run up, copy in hand, and shout them from your rooftop. Of course I have all of about three neighbors, so this metaphor is a bit of a stretch in this case. It'd probably work better in say, New York City, but you know what I mean. There are some recipes everyone should know about. That's how I've been feeling lately about chicken liver paté. I know, I know. Liver. Yech! It's slimy and bloody and nobody wants to deal with it. But friends, trust me when I tell you chicken liver paté is worth pulling out your coping skills for. Believe me, I wouldn't ask if it weren't a matter of absolute necessity, because I know how often they come in handy for other things, like taking out very old compost, or finding hairy pudding in the fridge. 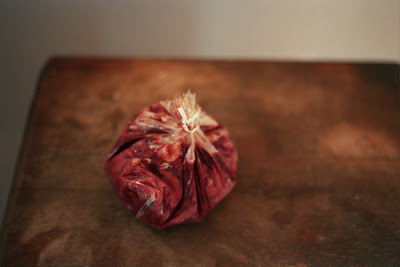 The thing is, if you can get past the livers themselves, the process is really actually delightfully easy. And if you've ever been an absolute mess over say, a good foie gras or paté de campagne or even a spread of liverwurst, you're going to find you spend an awful lot of time admiring this paté. It's a genuine masterpiece. I may be slightly biased by the fact that for several years of my childhood, I ate a liverwurst sandwich as many days a week as I possibly could. This can develop quite a paté hankering in a kid, one that lasts for life. And while I've chosen to blame this affliction on my grandfather, who did the same thing to my father, only much worse, because he did it to him in France, that doesn't really solve the problem. In fact, I think it makes it much harder to escape, sort of like an inherited disease. You see where I'm going with this. The good news is that even if I turn out to be terribly biased, I went ahead and tested this recipe on a good deal of friends, all of whom loved it, and none of whom admitted to any upbringing so persuasive as this. As for the cooking, it's easy really. (Just make sure you have plenty of butter on hand.) You simply sauté an onion in butter, set that aside, and cook up the livers in some more butter. Then you add the onions back in with some thyme, and then some sherry, and call it good. The whole mess goes into the food processor, where it gets whirled to creamy perfection, and then you work in another stick of butter, just for good measure. The most important thing to remember when you're thinking about serving it is that you should have some good, crusty bread or thin crackers on hand, and definitely some pickled things. Beets and bread n' butter cucumbers both work very well, I think. Cheese, in my opinion, is sort of overkill, but I'll leave that up to you. I can't wait to hear how it goes. I misread this recipe the first time I made it and used 8 tablespoons of butter rather than 8 ounces (meaning I put in 1 stick rather than 2). The funny thing is, until I went to type it up, I never even realized anything was amiss, and even my father heartily approved. You can add a bit more butter if you’d like, but there’s certainly no need to double the amount. An extra 4 tablespoons, I think, would be more than enough. In a large heavy-bottomed skillet, heat up 1 tablespoon of the butter and sauté the onion until translucent and soft. Remove onion and set aside, then in the same pan heat up 2 tablespoons of the butter and cook the chicken livers. They will take about 10 minutes to brown through, and it’s a good idea to stir or flip them occasionally. When they’re done, return the onions to the pan and add 1 tablespoon of the sherry and the thyme. Bring everything to a boil, reduce the heat to low, and continue cooking for several minutes. Turn off the heat and add the remaining sherry. Transfer the liver mixture to the bowl of a food processor with a metal blade and process it until it’s smooth. At this point, spoon the liver mixture out into a medium-size bowl and add the butter and salt and pepper. Work the livers and butter with a spatula until the two substances are well-combined. Pack the paté into several small containers or 1 pint container. (The paté will freeze well so long as it’s tightly covered, so if you divvy it between smaller containers, you can spread out the enjoyment a bit.) Serve as a spread on toast or crackers, preferably with pickles. *I got 3 pounds of livers from Pat's Pastured, a Rhode Island operation, when I went down to the winter farmers' market last month. If you can't find any near you, next time you buy whole chickens from your farmer, make sure you get the livers set aside. He/she might even be willing to give you more from other birds, so long as you ask. If all else fails, I'd call Northeast Family Farms. They have all sorts of goodies, sourced from farms across New England and hand slaughtered at their meat house. Oh my, that sounds divine. I ADORE liverwurst (most people think I'm crazy, but I get it, trust me). 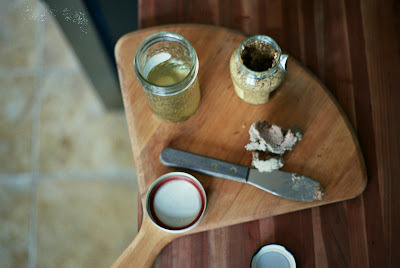 I tried to make chicken liver pate once, but the livers I bought turned out to be spoiled. There is NOTHING so foul in the world as the smell of spoiled livers, and well, it sort of put me off the idea of trying again. That was over a year ago and I'm still not quite over it. How distressing! I completely understand. However, I think it's time to get back on the horse. I think you'll be very, very glad you did.